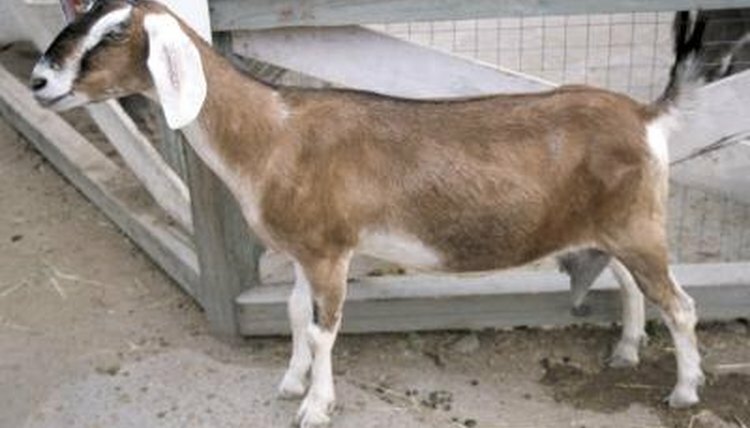 Goats are ruminants with four stomachs, so they eat throughout the day in order to keep food moving through their systems. Water, minerals and grains are the key components to feeding goats. Supply a bucket of fresh water, a mineral block and a feeding trough full of fresh hay, pellets and other roughage. A feeding trough keeps the feed off the ground so it doesn't get wet and helps reduce waste. A 5-foot piece of pipe will be large enough for about five goats, so cut the pipe to length. Cut the pipe in half so that it's a half circle instead of a tube. Cut the PVC cap in half, or to the height of your pipe. Use an acrylic glue to secure the cap to the pipe. Cut your 2x4 lumber at about 18 inches long. Cut at least three pieces -- one for each side of the pipe and one for the middle; longer troughs will need more support as, over time, the PVC can dip. Using screws, attach the 2x4 pieces to the pipe. If the screws go through the PVC, you'll need to trim them up to be flush against the PVC so your goats don't hurt themselves while feeding. Cut your 4x4 posts about 3 feet long. You will need two posts for each 2x4 you've attached to your pipe. Dig 12- to 18-inch deep holes for your 4x4 posts. Cement the posts into the ground or firmly pack them into the ground with dirt and sand. These posts will support your trough, so you want to make sure the holes are about 18 inches apart, depending on how wide you cut your 2x4 lumber. Flip the pipe over so the round side is on the bottom and screw the 2x4s into the posts.  Using screws makes it easy to remove and replace pipe or wood as needed without having to dig up the 4x4 posts.  Make sure to clean the feeding trough regularly.  The feeding trough should be about 12 to 18 inches off the ground.